I was reading Stanyon’s Magic recently, Volume 1 Issue #4. 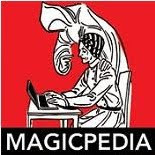 If you’re not familiar with Stanyon’s Magic it was actually called MAGIC edited by Ellis Stanyon and underneath the masthead it read “The only paper in the British Empire devoted solely to the interests of Magicians, Jugglers, Hand Shadowists, Ventriloquists, Lightning Cartoonists and Specialty Entertainers”. It ran from 1900-1914 and then again from 1919-1920. There were a total of 177 issues. Born in England in 1870, William Ellis Stanyon was a full time magician and magic dealer. He began publishing 'Stanyon's Serials' in 1899 which eventually morphed into MAGIC. 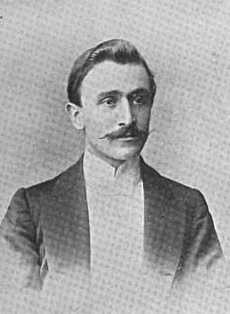 His periodical was 8 pages per issue and contained, news, tricks, reviews and gossip, as well as advertisements. 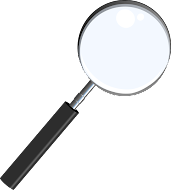 Occasionally other people would write articles for the paper, such as Henry Ridgely Evans and Arthur Margery. Houdini was featured on the cover of Issue #4 in January of 1901. He was appearing at the Alhambra and presenting his Handcuff Act. Stanyon goes on to say that the handcuff trick was a favorite of magicians and spirit mediums for many years, and then describes the method of a standard pair of handcuffs and a duplicate key. Then he begins to talk of Houdini and how he had taken this act to places unknown. He goes on to brag how Houdini accepts all challenges and will attempt to escape from multiple cuffs, rather than just a single pair. He makes note of a ‘new’ addition to Houdini’s act, what we know of today as the ‘Ghost House’ which was the small three sided curtained cabinet that surrounded Houdini while he did some of his escapes. He describes one escape by Houdini where he had handcuffs placed on his wrists behind his back and then he crouched down inside the cabinet, facing the audience, he was out in seconds. 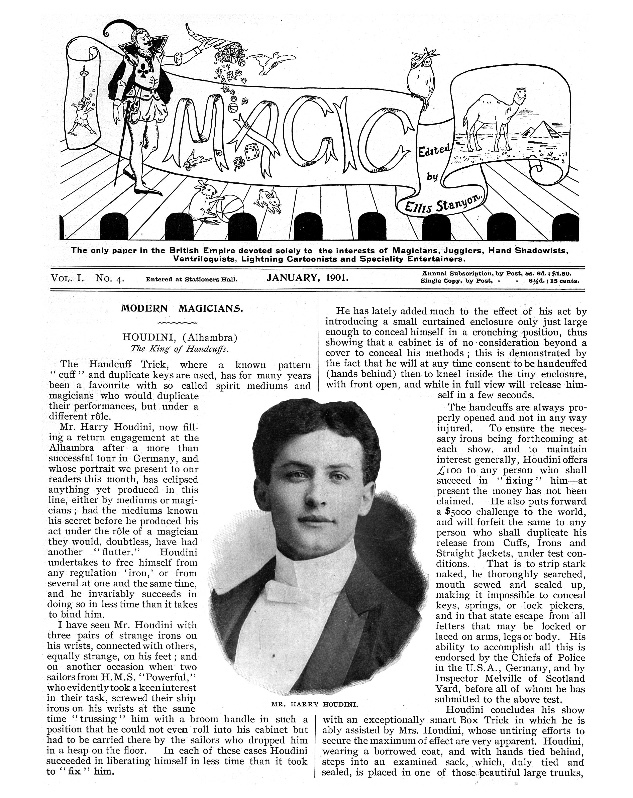 The final few paragraphs in the article were about Houdini’s box trick which Houdini called The Metamorphosis, and is known today as the Substitution Trunk. Houdini would borrow a jacket from a spectator and place it on before he had his hands tied behind his back. Then he’d climb into the cloth bag, which was tied and the knots were sealed and then the lid of the trunk was closed, locked and ropes tied around the box. Bess stands at the opening of the curtain and says “I will step into the cabinet and clap my hands three times-then notice the effect.” Instantly, Houdini bursts through the curtain and Bess is found inside the box, inside the bag wearing the borrowed jacket with her hands tied behind her back. A lot of detail in the Houdini Sub-trunk routine has been overlooked today. Houdini was the handcuff king, yet he did not use handcuffs during the Sub-trunk, instead he had his wrists tied with ropes. After-all, the audience would have seen him escape from countless cuffs, he had to make this different. The use of the borrowed jacket is something that other performers have used, but it’s not seen much today, if at all, yet it’s a brilliant addition. It makes the effect more personal because that borrowed object experiences the magic along with the artists. First it’s on Houdini and instantly it’s on his wife, at least this is how it appears to the audience. It can’t be a gimmicked or prepared jacket because it was borrowed, and often from a famous person. The ropes that are tied around the outside of the box add another impossible element. Even if Houdini could somehow get free of the tied wrists, the tied bag, there is no way he could get out of the trunk because not only is it locked, but it’s wrapped up with rope which he cannot reach! Yet in 3-5 seconds, Houdini appeared and Bess was somehow mysteriously inside the box. It’s one of the greatest effects in magic. It’s also one of the most copied. For those who say, Houdini was not a good magician, I point to his presentation of the substitution trunk. It was incredible in his era and it still lives on in the acts of magicians today. Now if I might go back to Ellis Stanyon for a moment. 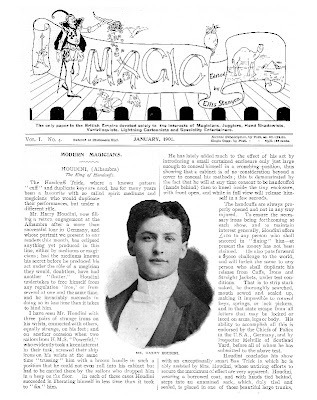 Stanyon bragged about Houdini’s clever twist on the escape act and his box trick in his periodical in 1901. 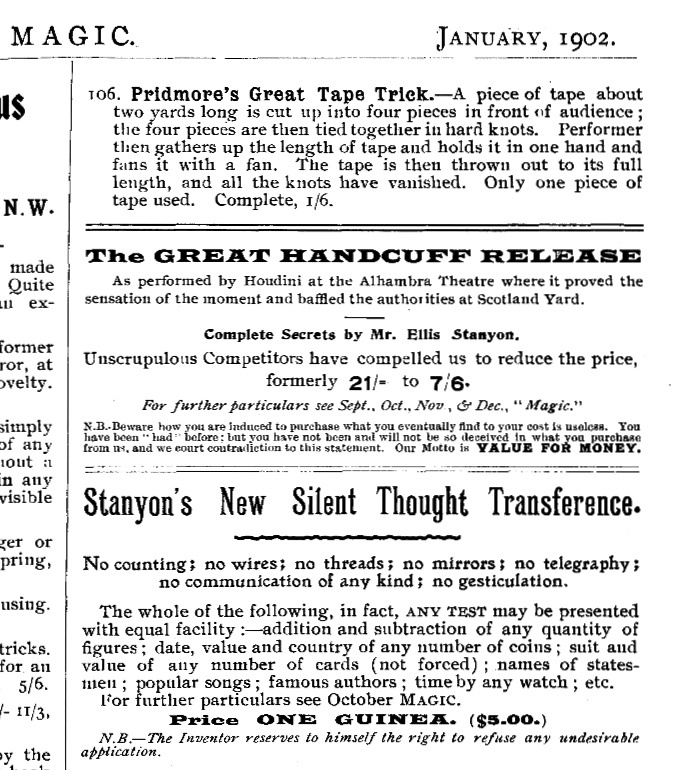 In October of 1901 an advertisement appeared in MAGIC for 'The Great Handcuff Release'. According to Houdini-The Key, Houdini and Staynon were initially working together to produce a manuscript exposing handcuff escape methods but the partnership turned sour. Then in 1902 he announced to his readers that for subscribers only he would feature in the May issue 'The Great Handcuff Release'. The article was apparently written by Houdini and the exact same article also appeared in MAHATMA Magazine in the U.S. as well. 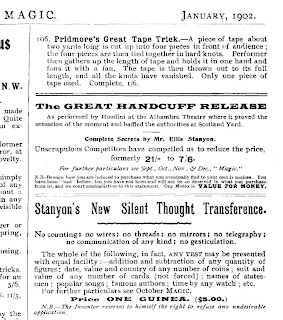 In October of 1903, Stanyon offered more material from Houdini’s act. Under the title, “Original Lessons in Magic-ILLUSION- Metempsychosis Double-Extraordinary” , this was a detailed set of instructions on how to perform the sub trunk. There was no mention of Houdini in either the handcuff expose article or the ‘original lesson’ on the sub trunk. However, the advertisement for 'The Great Handcuff Release' did mention Houdini's name. Houdini called his version of the Sub-Trunk The Metamorphosis, Stanyon referred to this version as Metempsychosis. The exact wording that Bess Houdini used when presenting the Sub-trunk can also be found within the description of the trick by Stanyon. Stanyon did change things slightly. His instructions have the trunk with the artist inside, being picked up and placed inside of a second box and locked and sealed. So there was a slight change to the routine, but otherwise it is the exact routine as presented by Harry and Bess Houdini. Incidentally, Houdini never appeared on the cover of Stanyon’s MAGIC ever again. But he was mentioned. In fact, in February 1909, Stanyon reveals his thoughts on how the Houdini Milk Can works. He does finish the column by saying 'The method is my own explanation, not necessarily the method employed by Houdini'. As for William Ellis Stanyon, he far outlived Houdini. His magazine continued until 1920 and he himself lived until 1951. His son Cyril took over the magic business, known as 'The House of Magic, though I'm not sure how long it continued afterwards. Today the original MAGIC lives on as a valuable resource for magic historians.